One of the best parts about summer is the fact that it means it’s time for engines to roar in Toronto. The Indy will be hitting Toronto on July 18th to 20th and is going to be a weekend jam-packed with two full points IndyCar races, festival attractions, games and activities and live entertainment. Honda has a corporate culture and history rooted in racing and has been the title sponsor of the Toronto Indy since 2008. 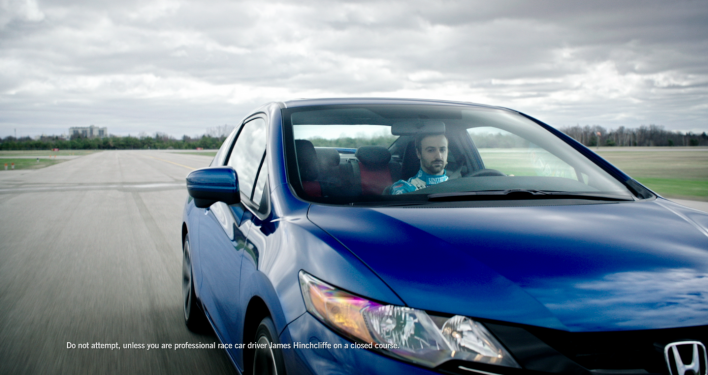 To bring attention to both of these facts, as well as the popular “Checkered Flag” sales event, they’ve leveraged their relationship with IndyCar driver James Hinchcliffe and have been featuring him in a commercial showcasing the sales event and the Civic Si. James Hinchcliffe, or the ‘Mayor of Hinchtown’ as he is known online, drives the #27 Indycar United Fibre & Data entry for Andretti Autosport. Born in Oakville in 1986, he started racing in open-wheel cars in 2003 after accumulating a slate of championship wins in Kart racing across Canada and the USA. From 2003 to 2010 he worked his way up through the open-wheel racing world, representing Canada in the A1 Grand Prix in 2006 and earning three podium results in 2007 as well as successful finishes within the top five in the Atlantic Championship in both that year and the following one. While competing in the Firestone Indy Lights Series in 2010, he won the Greg Moore Legacy Award as a rising star in the racing world. Since 2011, Hinchcliffe has been competing in the IZOD Indy Care series and was named Rookie or the Year for that season. In 2012, he earned is first Indy Car podium finishes, placing 3rd in races at Long Beach and Milwaukee, followed by three first place finishes in 2013 in St. Petersburg, Brazil, and Iowa. For 2014, Hinchcliffe can be seend racing and promoting the Honda brand across Canada at various events throughout the year, including the Honda Indy Toronto. He was also a surprise participant in the unveiling of the 2015 Honda Fit at this year’s Auto Show in Toronto. James Hinchcliffe has had an impressive racing career and is a Canadian icon in the sport. To learn more about him, check his official site Hinchtown.com. We love summer and racing here at Henley Honda almost as much as we love the vehicles we offer! If you want to feel like Hinchcliffe (or the other guy in the commercial) come check out the Civcs today!